Every year, forest fires consume thousands of acres of valuable land and this year (2008) has been one of the worst on record for California. And as I'm writing this note, the summer fire season has just begun. I live in the highly urban area of the Bay Area so we are in no immediate danger, although I do not have to drive very far to reach a fire. The latest word is that there are over 700 fires burning in our state at this moment. The air is gray, like a nasty high fog, but we know it's not fog, it's a smoky haze that has been sitting over the Santa Clara Valley for what seems like weeks now. It is difficult to breath, you can almost taste the acrid air, and our cars are covered in a thin, sticky film of ash and fire residue, along with everything else. We have been advised not to spend much time outdoors, which seems odd to us. California living has a lot to do with being outdoors. We've been told that this fire pattern has changed over the past twenty years. Forest fires are always part of summer here, but there have never been so many. It's another reminder of our "new" weather pattern caused, to great extent, by global warming. We don't get enough rain in the winters any longer and our forests are drier than ever. We are experiencing "dry lightening", something that used to be a rare a phenomenon here -- another weather anomaly that is now becoming more common. The lightening strikes have caused most of the fires in the high Sierra and northern woods, but some of the fires along our Central Coast are somewhat suspicious. There was a rumor circulating that some poor soul set his house on fire to collect the insurance. He hadn't counted on setting half the county on fire as well. So we can also blame "the mortgage mess" for a small part of the problem. As we watch the news in the evening, we cannot help but feel so sorry for the burned out home owners mourning lost pets and livestock, searching for family albums and small treasures. They stand beside a skeleton of a car, a haunted fireplace, the remains of their most prized possession that has been turned into ash. It's an awful nightly ritual. I wonder about the birds, the deer, the California brown bears and all the critters that are burned alive as the fires advance across the wide expanse of forest that they call their homes. The tragedy is mind boggling. And then we see the gaunt faces of the fire fighters, who sometimes work 24 hour shifts -- they work until they can no longer stand up, then they take a little break, get something to eat, and go back to work. We see them battling fires, sometimes with only shovels and axes, while helicopters fly overhead dropping water and fire retardant on the flames. They are the few who stand between us and complete destruction. 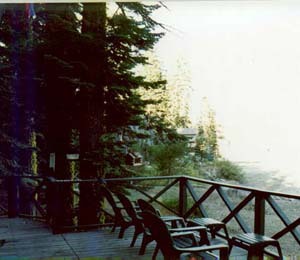 What follows is a story I wrote several years ago as our family vacationed at a small lake in the high Sierra. 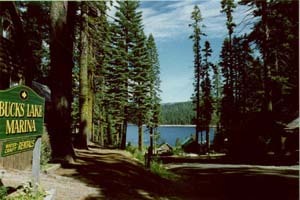 Bucks Lake is located in the Sierra, just a few miles southwest of Quincy, California. It's a reservoir lake, a smallish one as alpine lakes go, nestled in the Plumas National Forest. It's beautiful in the summer with an old-fashioned lodge, a camping area and summer cabins surrounding part of it. And trees -- tall pines, cedars, aspen -- the usual stuff of mountain forests, and bears and forest wildlife, skittering rodents, birds, summering geese and ducks. There's fishing, boating, hiking -- all the things associated with summer on the lake. We always make a summer trip up to Bucks Lake to visit with relatives. This year we scheduled our week in late August, a good time to get out of the California valley heat and head for the cool mountain air. Our route to the lake takes us through the town of Oroville, which is located in the Sierra foothills off Highway 99 south of Bucks Lake and Quincy. We travel the back road that's only open in the summer. It's just outside of Oroville. It's a much shorter drive than up the Feather River Highway. Even before we reach Oroville we begin to notice the distinctive hazy smoke of forest fires in the area. The newscast had reported local fires near Oroville, Paradise and Chico. There are hundreds of firefighters in the area and the reporter cautioned that things could get worse. The smoke gets stronger as we start up that back road out of Oroville. We even notice small trails of smoke in the trees along the way. When we reach the lake we are quite surprised. A thick blanket of smoke hangs over it, dimming the outline of the far shore, which isn't really that far away. We smell the smoke and feel it when we get out of the car. There were no campers in the campground and very few boats out on the lake. There was so much smoke hanging over the water, I couldn't see the far shore. Nevertheless, we spend a few hours out on the lake that first night, fishing and meandering around. 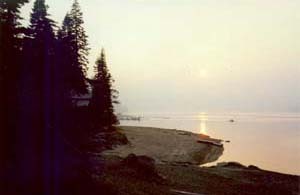 The fish are not biting, and the usual Bucks Lake sunset is obscured by the smoke. By the next morning, the smoke is even heavier. There are bird feeders with seed and hummingbird food hanging right beside the deck. I always enjoy watching the birds in the morning. But there are no birds our first morning. The forest is strangely still, nothing moved, not even the trees. In past times, I always marvel at how loud the trees are when it's windy. There is no wind, just the prevailing layer of smoke pressing down on us. As I sit there watching the feeders, eventually I notice a little movement. A tiny chipmunk appears, finds its way to the feeder, and proceeds to fill up on birdseed. A few Canada geese swim by. The neighbors feed them. The geese are on patrol but there is no sign of life at the neighbor's cabin, so they move off. A small fleet of ducks land by the boat dock and begin bobbing around and sifting the water near the shore. Then they too move off. Still no song birds. Did they leave the area or go into hiding when the smoke got too thick? 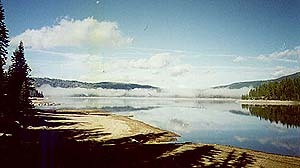 Usually at sunrise you can see the far shore, even when the morning mist still rests on the water. We walk over to the lodge to get a newspaper and to check on the fires. We want the lodge people to know we are in residence. They tell us if the fire gets too close they'll come around and knock on the door. The newspaper prints guidelines for surviving a wildfire. We should stay indoors, park the car headed toward the road, leave the front door unlocked at night. If things get real dicey, pack the car with essentials, valuables and pets! All good advice, but rather disconcerting when you're on vacation with the idea of breathing fresh mountain air, hiking in the woods and boating on the lake. Cabin fever sets in quickly with those kinds of restrictions. A couple of days can seem like a month. One night as we toss and turn in fitful sleep, we hear what sounds like rain on the roof. That too is a little surprising. First off, it rarely rains in California during the summer, and second, it's a summer rainstorm with lightening that had set off the forest fires in the first place. Would lightening strike nearby and make things even worse? B morning out on the deck, the air seems fresher, cleaner. My eyes don't sting so much and the smoky haze is gone. I can see the far shore. There had been gentle rains in the night, but no lightening. The chipmunk is sitting in a nearly empty bird feeder. Then I notice another movement in the tree branch. A bird, then another, are heading for the feeder. No birds visited the feeders this day. Next I hear that distinctive hummingbird click and finally notice two of the smallest little hummers I've ever seen, heading straight for their feeder. Birds seem to be everywhere, the bushes were alive with them, and there are more ducks than ever on the lake. The sun is shining, the air is clear and it seems like things are returning to normal. Over the past few days we had heard various fire rumors from the lodge. The back road had been closed, then opened and then closed again. Now itis once again open, but the word is that only local residents would be allowed to use it. We decide it's time to go home. We hurriedly pack up the car. The windshield is covered with soot and the smoky smell lingers inside the car. The road is deserted so we make good time. About halfway along the hour-plus drive to Oroville we come onto the fire trucks parked alongside the road, and then we see the burn area. The foothills are truly fire hazards in the summer because the vegetation -- dry grasses, scrub oak, stumpy pine trees and manzanita -- are all dry and burn fast, like kindling. We can see the pattern of spot fires along the slopes. It had been a quick fire that burned and jumped, scattering the fire over large areas, burning right down to the road before stopping. No wonder the road had been closed. Then we see power lines down along the ground, another problem waiting repairs. We pass over fifty pieces of fire equipment along that road. When we are finally able to pick up a news broadcast on the radio, we hear that the national guard had been called in to help with the blaze, but that things are looking good and they expect the fires to be contained before too long. Good news. 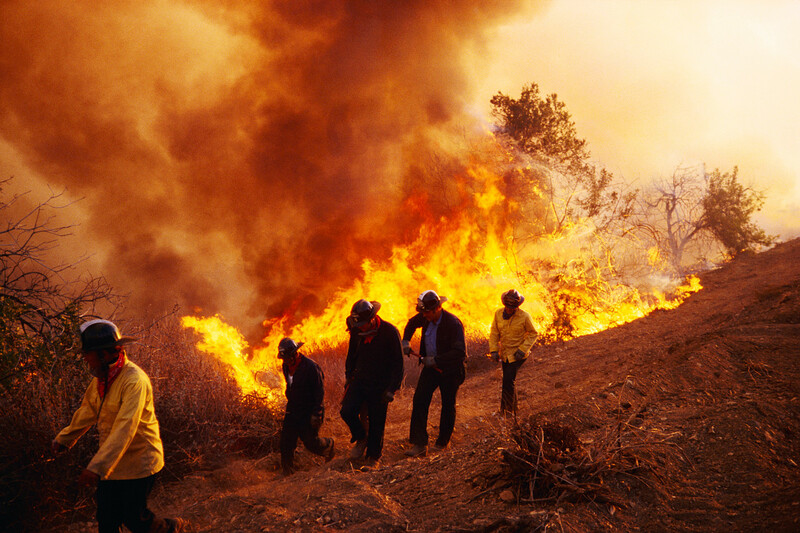 California is just beginning its annual "fire season" but already there are fires blazing up and down the state. Thousands of acres have already burned, and thousands of firefighters are working diligently to put them out. The newscasts usually limit their fire coverage to reports of numbers of acres burned, numbers of firefighters involved, the number of structures burned and lives lost, and of course, the dollar amount spent fighting them. Sometimes we forget the other invaluable losses we sustain in forest fires. We lose trees, of course, and vegetation and watershed. We lose insects, reptiles, rodents, bird habitat, and small and large animals. And these losses especially devastating when firefighters must resort to back fires to contain blazes. Animals become trapped within the circle of fire with no escape -- a dreadful end for those unacknowledged innocent victims. Forest fires are a natural fact of life, something that we always have to contend with. Fire-fighting technology has helped control and limit the extent of damage done by them, but there is only so much they can do. We take it for granted that the forest will recover and that eventually life will go on. But, as more people move into the rural mountain areas, the danger increases, for both humans and wildlife alike. Environmentalists claim that droughts from global warming, acid rain, increased human settlement, logging, and increased water use have all placed enormous pressures on wild lands. Some even claim that these pressures weaken forests to the point where their survivability can no longer be guaranteed. These claims have not yet been supported by scientific certainty, of course, but the fact remains that our forests are in danger, both from fire and from human impact in a variety of ways. We must give some thought to what is important to our planet and as well as to our society. As the old saying goes: we should think locally and act globally. In the meantime, we owe a tremendous debt of gratitude to the men and women who work on the fire lines to protect our beautiful natural world.